There are lots of different types of tobacco products readily available today, many of which will claim to be safer or less harmful than others. What you need to know is that all forms of tobacco are a risk factor for disease and contain nicotine, an addictive drug. 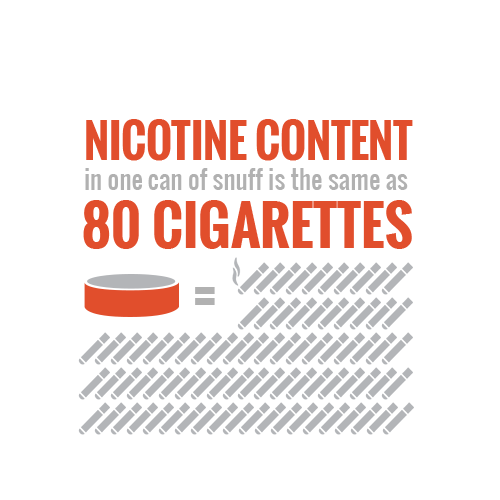 Check out more facts about each kind of tobacco product below. Cigarettes contain more than 7,000 chemicals, 70 of which cause cancer. Cigarette smoking is responsible for about 30% of all cancer deaths. There are an estimated 42 million adult smokers in the U.S., which is about 18% of the adult population. Cigarettes can cause cancer in more than 14 areas of the body, and increase your risk for coronary heart disease and lung disease. The nicotine and other additives in electronic cigarettes are heated up via battery power and delivered to the user in an aerosol form. Studies have found major discrepancies between the labelling and actual nicotine content of e-cigarettes. Use of e-cigarettes among middle school and high school students has tripled since 2011, but researchers warn the long-term consequences are still unknown. Hookah contains toxic substances that cause cancer. Hookah carries many of the same health risks as cigarettes, including clogged arteries and heart disease. Smoking hookah may actually cause you to take in more toxins, because a typical 1-hour sitting will have you inhaling 100-200 times the amount of smoke of a cigarette. Cigars are just as addictive and deadly as cigarettes. Cigar smoking can lead to many of the same cancers as cigarette smoking, as well as heart and lung disease. Unlike cigarettes, it’s legal for cigars in the U.S. to be flavored, which can cover up the harshness of the tobacco smoke. Bidis are hand-rolled cigarettes imported from Southeast Asia. Kreteks are clove cigarettes imported from Indonesia that contain 60% tobacco and 40% ground cloves. Both are banned in the U.S. because they have higher amounts of nicotine, tar and carbon monoxide and are often flavored. Using chewing tobacco causes cancer of the mouth, pharynx (throat), larynx (voice box), esophagus, stomach and pancreas. Chewing tobacco has a terrible effect on your oral health, causing receding gums, gum disease and tooth decay. It has also been linked to heart disease and stroke. Learn more about the deadly ingredients in tobacco products.